Well, it stands to reason really. With each one measuring five feet in diameter, trussed up in nylon twine and weighing 2,000 pounds, a few of those shifting position would make it really difficult to go straight. I’m so sorry. I mean bale conditions. No wonder you’re looking confused. It’s that time of year you see, harvest safely gathered in and all that. Well, I say safely. Not on Oxney. In days of yore, whenever that was, when the drooping ears of wheat signalled they were ripe for reaping, one man could scythe his way through one acre in a day. Modern combine harvesters can reap an acre in 15 minutes, which is when the problems start. Combines can cost up to £380,000 which is a lot of dough to have sitting for the best part of a year beneath the roof of a crumbling barn that you can’t afford to repair because you’ve spent all your money on what it’s meant to be protecting down below. So farmers tend to hire the combine and the driver on a fixed service contract when they need them and timing is always tight because every field of wheat has this unfailing and inconvenient habit of ripening at pretty much the same time as its neighbours. Which brings me to two brothers, Jacob and Jonah (not their real names). I’m lying, that’s their real names, I like living dangerously. They’re each responsible for operating the two trailers that transfer the grain collected by the combine from the field to the Oxney Farm silo. They both sit there waiting, one with tractor engine throbbing as if he’s on a Formula One grid, waiting for the signal that the time has come. Jacob usually gets first dibs (seniority) and once his trailer is full, he’s off, thundering round the field and then out onto the road that both brothers mistakenly believe is the Silverstone race track. Schoolchildren, dog walkers, cyclists, car drivers, even other tractor operators throw themselves into the hedgerow as soon as Jacob hoves into view, his face a grim portrait of murderous intent. Because this is serious. This is a time trial. He has to get to the silo, discharge the grain and return to the field in a quicker time than his brother can achieve. Thirty mile an hour speed limit through the village? Pah! That’s for wimps, not macho man at the helm of 31 tonnes of tractor and trailer he couldn’t actually stop if he wanted to. Once Jacob is back on the field the brothers agree the time taken and then it’s Jonah’s turn to beat that time and scare the living daylights out of the population. 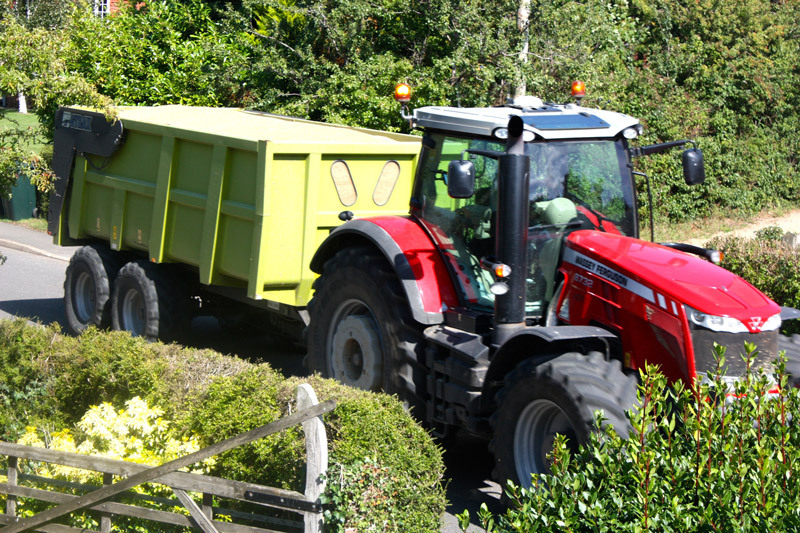 And not just the daylights: the combine harvester doesn’t stop during the night so the headlights are illuminated on all vehicles and the rabbits, badgers, hedgehogs and foxes find its their turn to play chicken with Jacob and Jonah. Pity the poor holidaymakers who occupy the converted barn set between two tracks and used by the manic duo as a makeshift roundabout. Attracted by the description of its bucolic setting, stunning views and dark, silent evenings, the occupants can often be seen standing in the garden with either a cup of coffee or glass of wine, depending on the time of day, as they stare in a bewildered fashion at the vehicles churning up the dirt on their seemingly never ending and noisy forays past the house. It doesn’t stop once the combine harvester has served its purpose; the grain might be gone but now the baler moves in to hoover up the neat rows of leftover straw and jettison the aforementioned 2,000 pound monstrosities out the back. These are then lifted by a massive fork lift onto two trailers driven by, yes, Jacob and Jonah. You’re ahead of me. Each trailer can hold 17 bales: six pairs on the bottom, five singles on top, all of them strapped in securely by whichever brother isn’t the driver of that particular trailer. The time trial thereafter to get the bales back to the farm isn’t as frenetic as the grain run, but only just. This year turned out to be a bit of a disaster. Jacob swears he fastened everything sufficiently but on the run through the village, cornering past the antique shop, the bales shifted, taking the trailer with them and Jonah found he could no longer go straight and his tractor ploughed (pun intended) into the garden of Rose Cottage which, unsurprisingly, no longer has any roses. Or brick wall. Or garage. With Jonah swearing that Jacob had done it deliberately to damage his timed run, it didn’t take much more to tip him over the edge. During one of their competitive drinking sessions in the local pub, Jonah mentioned that his rather well built new girlfriend (who thankfully wasn’t present) had a face that could launch a thousand ships. Jacob countered with his observation that no, she just had an arse that could occupy several seats. Jonah left in high dudgeon and came back in a tractor. And shortly after leaving the pub, Jacob found himself suffering from a broken leg having been pinned to the car park wall by several tonnes of angry metal. Jacob’s out of hospital and there’s no doubt, unfortunately, that he’ll be back to fighting fitness for next year’s harvest. And Jonah? He’s out on bail. Jacob or Jonah? It hardly matters, they’re both as bad as each other.